Monster Hunter is an action role-playing game for the PlayStation 2. The game was developed and published by Capcom. The two art books I have here are titled Monster Hunter Illustrations, one for color illustrations, the other for black and white sketches. The Japanese title is モンスターハンターイラストレーションズ (カプコンオフィシャルブックス). The colour illustrations book is 240 pages, while the other is 64 pages. Starting with the colour illustrations book, it contains the concept art for the monsters, characters, armour and weapons. All the art are drawn in detail with Japanese captions. Some monsters even have their bone structure drawn. There are over 100 of drawings for the monsters. For character designs, there are 300 variations, different and same characters in different armour. It's just so fun looking at the armour and weapon designs. They are clearly created with the emphasis of using materials found in that world. It's amazing the different kind of weapons that can be created with dragon bones, and still look good. Finally, there are also cartoons drawings, promotional marketing art and game screenshots. The other book contains black and white sketches. They are mainly on monsters and characters but rougher in details. This book is also thinner. This book is most highly recommended to Monster Hunter fans, video game and fantasy artists. Be sure to check out モンスターハンターCGアートワークス (Monster Hunter CG Artworks) as well. It comes a two book set, that's why! You can find this book on amazon.co.jp. Amazon.com doesn't have it. Isn`t there any way to get these Japanese Artbooks, when you do not live in Japan? Or do I just have to make an account on Amazon.co.jp (Even when I do not understand anything, does this means "Name" or "Adress" ^^) ? I mean, as a german it is a little bit difficult to get those artbooks, if Amazon.de doesnt have them, ok, there are some Import shops, but they dont have got a lot of things to offer! You can check out the Amazon Japan Buying Guide I've written. This is absolutely one of my most favorite art books to date. The main reason being that it's actually filled with pretty much nothing but art unlike some other art books I've seen for example the shadow of colossus art book. Im a huge fan of the MHF series. First where did you find these and what would the best place to hunt for bargains? Secondly, I can't wait for the U.S. release of MH Frontiers. Yessness. lol. I bought mine from Amazon Japan. 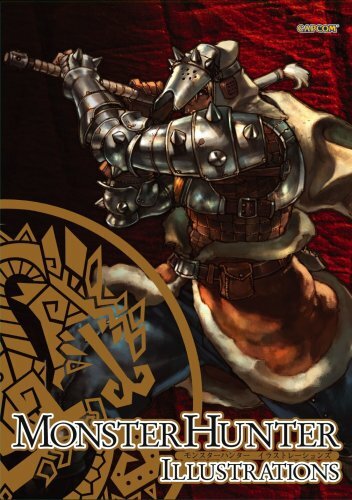 Also check out other Monster Hunter books. I bought my book at Little Tokyo in Los Angeles, California. And I also saw many stands selling them durring Anime Expo, witch is also in Los Angeles, at a good price. This book is getting a US release by Udon and is available for preorder on Amazon! Too bad they keep pushing back the date over and over.